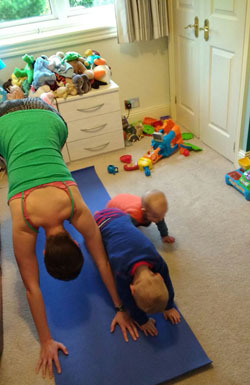 yoga | "Keep Running Mummy!" A couple of times a week, while my husband is bathing the kids (i.e. getting them so hyped up with splashing and songs and bubbles it takes them about three hours to wind down), I retreat into my son’s bedroom with my yoga mat, and indulge in 15 minutes of yoga and stretching. In part, this is to ensure any post-run aches from the week get soothed, but I also do it because, well, it’s just bloody lovely, isn’t it? Yoga. Alone. In my pants (if you can’t do yoga in your pants in the comfort of your own home, where can you?). Staring out of my son’s bedroom window, across the garden and up at the sky. Except for one tiny detail. So now, instead of having their bedtime stories curled up with Daddy in our bedroom, everyone sits on the sofa bed in my son’s room, listening to stories and watching me attempt sun salutations. Oh goody. And then, last night, just as I was about to yell, ‘OH MY GOD, GET OUT, ALL OF YOU! CAN’T I HAVE EVEN ONE MINUTE BY MYSELF THESE DAYS?’ (or something), a lovely thing happened. My son performed a near-perfect downward-facing dog while asking excitedly, ‘Mummy, am I doing it? Am I doing it, Mummy? !’ My baby girl clambered around my legs, babbling away. We stood like trees (OK, we swayed like trees). And it was fun. Yoga is about peace. But it is also about love. I guess every now and then, my yoga time might be invaded. But that’s OK. I can’t think of a nicer way to spend some quality family time before bed. 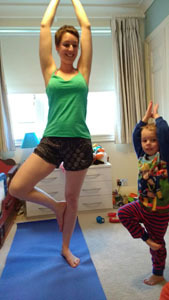 This entry was posted in Exercise and tagged baby, bedtime, children, downward-facing dog, Exercise, family, love, motherhood, Mummy, peace, post-run, stretching, tree pose, yoga on April 19, 2016 by Claire.